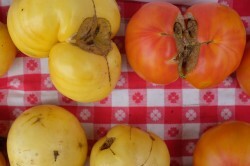 Ugly food, which is cosmetically imperfect food, has been receiving increased attention on a national basis. End Food Waste, nationally, and Ugly Food of the North, locally, are asking sellers and consumers to take another look at produce and to realize that while that carrot may be a little crooked, it is still just as tasty and nutritious. According to ReFEDToday, the United States spends $218 billion a year growing, processing, transporting, and disposing of food that is never eaten, totaling 70 billion pounds each year, and the amount of produce wasted, before stores, is 20 billion pounds per year. 52 million tons of food is sent to landfills annually, plus another 10 million tons is discarded or left unharvested on farms. After End Food Waste’s petition on Change.org asking the retail giant, Walmart, to offer “ugly” produce in its stores nationally made some headway (Walmart is selling imperfect apples in 300 Florida stores as a test), a group of Fargo-Moorhead residents decided to create a petition asking local Walmart stores to sell “ugly” produce – produce that is just as nutritionally sound and tasty. The petition currently has 330 local signatures. They then decided to host an event in conjunction with the Red River Market, encouraging farmers to bring produce they wouldn’t typically try to sell. They asked people to purchase the imperfect produce and make a dish to share for a special potluck. Gia says, “We weren’t really sure what to expect, but over 100 people showed up and wanted to know more.” The local group currently has over 1,600 Facebook users. On Sunday, August 21 from 11 am – 2 pm, Ugly Food of the North is hosting a pop-up event at Josie’s Corner Café in downtown Fargo, utilizing fruits and vegetables that would have otherwise been wasted to create a community meal. On September 1, they are celebrating a first birthday at Drekker Brewing Company. Check Facebook for details as they are finalized. Another avenue for this is the Little Free Garden Project, which fosters communities committed to growing, sharing, and cultivating food in small, raised gardens, designed for residential spaces. Currently, although Walmart is experimenting with ugly produce in Florida, it is not committed to a program. But other grocery stores have begun to move forward. Jordan says that each of these programs sells for a discount of 20 to 50 percent, stocking multiple items year-round. You can help by signing the local petition, donating money or time, asking for change from your local supermarkets, and shifting the way you view that slightly askew tomato.